Anna Kelly loved her job as pilot with the RFDS, and now based in Broken Hill, her old home town, she was finding things much the same as they’d been all those years before. The only issue she had was her fifteen-year-old daughter, Isabelle whom she’d left in Adelaide - and missed desperately – she was living at the boarding school and Anna’s sister Teresa was on hand if Izzy needed anything. Anna settled in easily in Broken Hill, house sharing with Beth. With their shift work often coinciding, Anna and Nick became friends, although Anna kept her emotions firmly locked away. Flying to outlying properties and rural districts to take clinics, pick up patients and transfer them back to Broken Hill or Adelaide was the dream job Anna had always wanted. But trouble had a way of finding Anna – and Nick as it turned out. What would be the outcome for these two friends? 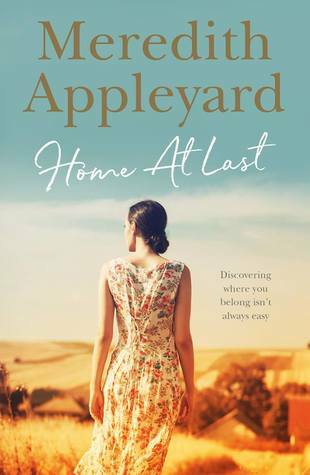 Home at Last by Aussie author Meredith Appleyard is a delightful medical rural romance, set in and around Broken Hill, NSW, with the RFDS (Royal Flying Doctor Service) at its centre. The vast countryside and fascinating insight into the RFDS culture was well done. I’ve loved this author’s previous work, and this was no different. Highly recommended. Sign into Goodreads to see if any of your friends have read Home at Last.